The tiny village of Carham lies in the very north-west corner of Northumberland, at the point where the Anglo-Scottish border breaks away from the line of the Tweed and cuts southwards across country towards the Cheviots. It is known for not one, but two, battles, of which the consequences of the second led to the establishment of the present-day frontier between the two nations. Battle No.1 is a shadowy affair. It took place in 833AD between the Danes and the English, at a time when the border itself didn’t really exist (the whole region forming part of the kingdom of Northumbria). The Danes, who were ‘on the up’ at the time, were flexing their muscles against a declining Northumbria and routed the defenders, killing ‘eleven bishops, two counts and a great number of people’ in the process. Within thirty or so years, Northumbria was a puppet kingdom of the new-fangled Danelaw. Whereas the 833 battle took place probably quite near to the village (a little to the south-west, we think), the second encounter in the early eleventh century more than likely occurred two or three miles to the east in a field between Wark and Coldstream (indeed, this second battle is sometimes called the Battle of Coldstream). And we don’t even know the exact year for this one – but it was either 1016 or 1018. By this time the Scots were trying to exercise ever greater control over Northumbria’s northern lands (Lothian and what we now know as the Border counties), and it was they who seemingly provoked the flashpoint in question. Though England existed as a united nation at the time, the defence of the attack was left to a local Northumbrian army. And the Scots, led by King Malcolm II and Owain of Strathclyde, won the day. The victory established Scottish rule in the present-day south-east area of Scotland, being essentially the land north of the Tweed - though there is some dispute about the significance of the battle, as the Lothian region may effectively have been ceded by the English much earlier. What is not in dispute, though, is that the (second) Battle of Carham put the matter beyond doubt. This didn’t stop the Scots trying their very best to push the border ever southwards (most notably during 1139-57 when they ‘ruled’ as far south as the Tees). 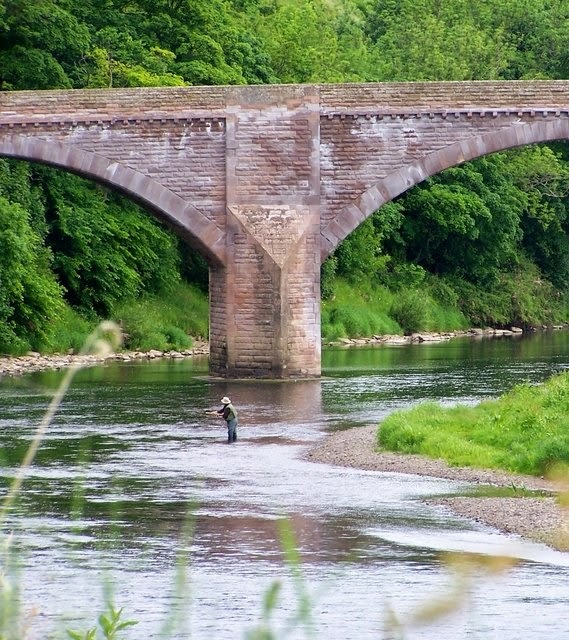 However, the boundary eventually fell back to the line of the Tweed as a result of the Treaty of York in 1237, where it has stayed ever since … apart from the odd little tweak here and there! Twizel Castle is a curious affair. It began life as a plain old mansion house/tower, almost became a sort of mock castle and ended up being a man-made ruin as its masonry was plundered by its owner for a new home. Essentially, it is one of our best examples of how much time and money the very rich can waste when they put their minds to it. What is left of the building stands above a bend in the River Till, overlooking a notable medieval bridge which shares its name. Nearby can be found the scant remains of a deserted village. Originally, a tower house stood on the site, dating back to at least 1415 when a Sir John Heron ruled the roost. This structure was twice visited by the Scots: once, in 1496, to destroy it; and a few years later they passed by again on the way to their defeat at Flodden (1513). 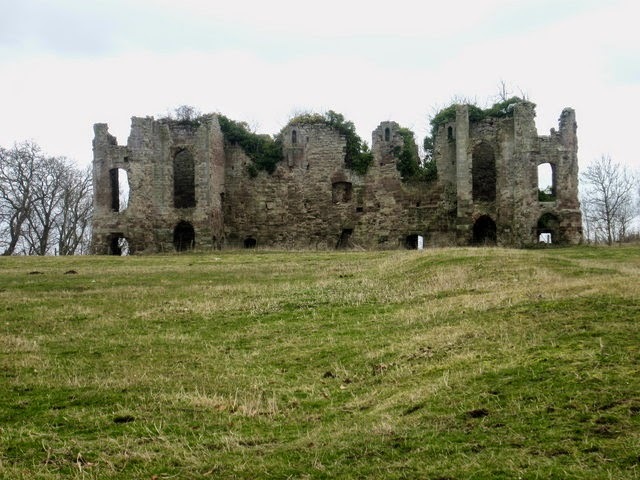 The Selbys soon afterwards took over the plot, though the tower remained a ruin, and despite substantial subsequent redevelopment a few of these original medieval remnants can still be made out. In 1685, the Blakes bought the estate, though they spent much of their time at nearby Tillmouth Hall. From the 1770s, though, they finally decided to splash the cash, and Sir Francis Blake embarked on a ‘Gothic Revival’-type renovation job on the sad old pile of stones. The project went on and on and on – long beyond Sir Francis’ death – for nigh on half a century, until work fizzled out in the early Victorian era. In the 1880s, the family built a new mansion elsewhere on the estate, and Twizel Castle hung on as an empty, unfinished shell for ages. It appears that the structure was never even lived in. Twizel Castle (and Bridge), probably around 1900. If you’re thinking that the mighty-looking edifice has decayed rather speedily in a century or so, this can be explained by the fact that its owners (the Blakes) recycled stonework in their various building projects elsewhere – including their new mansion at Tillmouth Park – with bits and bobs finding their way into Norham Station, too, apparently. As a result, it went from a magnificent five storey affair to the two storey ruin we see today. Anyone who knows anything about the ancient history of Northumbria will be aware of the region’s strong links with early Christianity. Aidan, Cuthbert and Bede dominate the annals of our history from the former’s arrival here as a missionary in 635AD to the latter’s death exactly a century later. And the village we now know as Norham on the very edge of England overlooking the River Tweed played an important role in those formative years. These days, of course, the castle is the great symbol of Norham’s place in history, but this fine structure didn’t appear in its earliest form until the 1120s. Unlike most other settlements in the North-East, the village had already enjoyed an eventful and quite well documented history up until this point, mainly due to its situate. Skipping conveniently over its very earliest days, it came to prominence most notably at the dawn of Northumbria’s period of Dark Age dominance in the 630sAD. When King Oswald won the crown of the northern kingdom in 634 he invited the Celtic monks of Iona to establish Christianity in the region – and it was, of course, Aidan who made this happen. He was sent over from the little Scottish island in 635 and, by passing over the Tweed and through Norham en route, he first brought the village into the sightlines of the religious community. Norham was then called Ubbanford (‘upper ford’), and though Lindisfarne soon became religious HQ, it has been suggested that Norham enjoyed a brief period of superiority beforehand. Even in later years it remained a regular monkish stopping-off point on their journeys to and from Iona. A grant of land was, in fact, made to create a monastery at Norham as early as 655. The village’s religious links were reinforced during the ninth century when on at least one (and probably two) occasions, the remains of St.Cuthbert were moved there to keep them safe from Viking raids. By the mid eleventh century Ubbanford had become Norham, and was essentially the capital of the County Palatine of Durham’s lands in North Northumberland – or North Durham, as it was for centuries known. So, yes, Norham (or Norhamshire) and a good deal more of the northern reaches of Northumberland weren’t in Northumberland at all, really, from the medieval period to the Victorian era, but rather they were part of County Durham – a curious state of affairs brought on by the enduring religious heritage of these stretches of land. Amazingly, it wasn’t until 1844 that the common sense switch was made by handing North Durham to Northumberland. When the castle came along in the 1120s, it was a Bishop of Durham who commissioned it. Built to keep the incursions of the increasingly boisterous Scots at bay, it encouraged the development, in time, of the the village proper. Then another very different phase in Norham’s history began… as a military outpost. And, yes, Tweed cloth derives its name from its association with the river. Spanning the River Tweed about a mile downstream from the border village of Horncliffe lies a little known piece of European engineering history in the shape of the Union Chain Bridge. 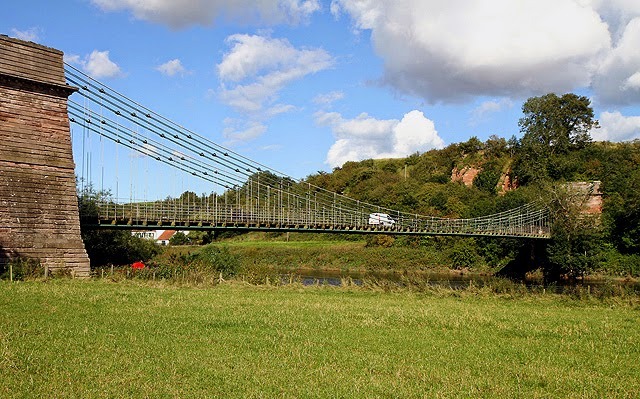 When opened in 1820 it was the longest iron suspension bridge in the world and the first of its type to carry vehicles. It stretches for a mightily impressive 449ft, linking England and Scotland, and does so quite majestically. It was built because there was a need for a river crossing at this point – primarily for the transportation of coal and lime (the latter for agricultural use). Financed by the local Turnpike Trusts, the commission for its design and construction was handed to retired naval officer, Captain Samuel Brown, who reckoned he knew enough about iron chains and links and such like to suspend a roadway across the considerable gap. And, at a knock-down price of £6,500 and an eleven month schedule, he delivered as promised. When it opened on 26th July 1820, it was quite an occasion. Some of the most important civil engineers of the day were present (including Robert Stevenson and John Rennie, who both had some input into the scheme), and its strength was proven with the crossing of several loaded curricles and carts as well as 600+ pedestrians. The lengths of chain hung from two giant towers, and the bed of the bridge was made of wood. 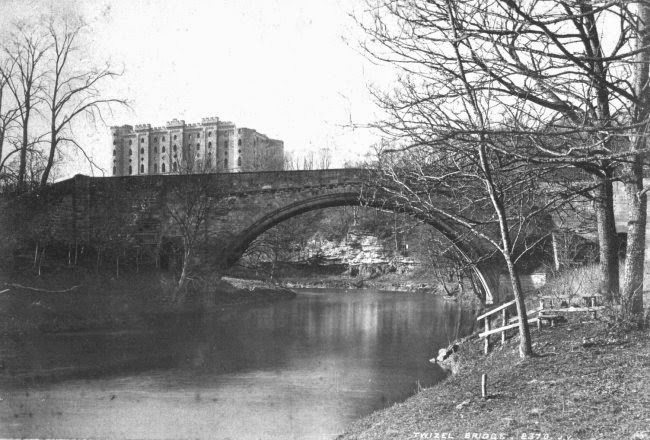 The bridge’s upkeep was financed by tolls – until 1883, that is, when tolls were abolished. The essentially sound bridge has, of course, been patched up over the years – most notably in 1871, 1902 and 1974 – but it is now in need of around £5million’s worth of repairs to restore it to tip-top condition. And the campaign is on to do just that in time for its bicentenary in 2020 – see here.